In Now Playing articles PC Gamer writers talk about the game currently dominating their spare time. Today Ben builds a friend from scratch. Me and my travelling robot are a regular odd couple, he with hammers for fists and me with human-sized fists, he grappling with the quandaries of existence, me fairly comfortable in my sentience. Oh how we laugh when poison gas from his rear-mounted toxic canisters suffocates a group of super mutants, HA. HA. HA. That’s actually what I’ve named him, the tip of the silicone mastication module taking a trip of three steps down the platinum palate to tap, at three, on the bone fangs. 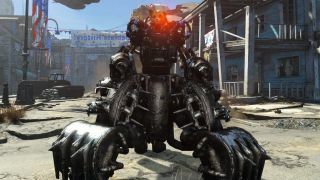 After playing through Fallout 4’s Automaton, an expansion that lets you create companions from the building blocks of life—ie, oil, screws, plastic—I can’t imagine the Commonwealth without this bucket of bolts. I can customise HA. HA. HA’s appearance at my workbench in Sanctuary. First, I arm him with weed-whackers, give him a grinning skull through which to communicate using beeps and boops, and paint him jet black, but I’m finding him hard to like. A bit inaccessible. I want a companion both charming and despicable—the boundless enthusiasm of a dog mixed with the deadliness of a tank—so I embark on Automaton’s questline. It sends us hunting a mysterious figure called the Mechanist, whose merciless machine army is causing havoc. Where is he hiding? A brain in a jar of liquid promises to reveal all if we build her a body. “It isn’t quite what I had envisioned,” Jezebel remarks of her new vacuum cleaner arms and squat refrigerator torso, “but I suppose it will have to suffice.” Rude. And she kills people, too. “Assisting a human to the best of my abilities only affords a 25% survival rate,” she says. “Therefore it’s better to hasten the human’s death and put them out of their likely chance of misery than to deplete my limited time.” Once she tells me the Mechanist’s location, I use my new arsenal of toys to blow her up. This DLC gives me a hollowed-out eyebot to wear on my head, Tesla T-60 power armour that decorates my pauldrons with hissing electrodes, and the laser-pulse-emitting head of a salvaged assaultron ‘bot I hold by the spinal cabling. Robot De Niro is the smiley emoji taken to its frightening natural conclusion. All this I bring on my exploits with companion 2.0, Robot de Niro. He is the smiley emoji taken to its frightening natural conclusion: an expression of joy carved into rusted sheet metal, with a drill on one hand and a flamethrower on the other, and sleek people-shaped legs for that much-needed form factor. Bless him, he often brings me gifts, like lightbulbs and dishrags and broken toasters. Thankfully his carrying capabilities dwarf mine due to the extra packs and pockets I’ve strapped onto him, so I immediately give it all back, and he’s glad of the work. My dog-tank dream is a reality. We finish Automatron in an hour or two, but with hordes of rogue robots still out there, the adventure is just beginning. I’ve found a friend in this cold, calculating, and endlessly configurable robot.